Affiliations - Computerized Inventory System Specialists Ltd.
CISS is affiliated with many Local and National networks. These networks help us to broaden our knowledge, and focus our efforts on industry trends. This keeps us, and our software up to date with evolving technology and techniques. The Association for Operations Management builds operations management excellence in individuals and enterprises through superior training, internationally recognized certifications, comprehensive resources, and a worldwide network of accomplished industry professionals. Council of Supply Chain Management Professionals is the preeminent association for individuals involved in supply chain management. CSCMP provides educational, career development, and networking opportunities to its over 10,000 members and to the entire profession. The Warehousing Education and Research Council (WERC) is the only professional organization focused exclusively on warehouse management, providing practical, how-to information to help members grow professionally as they improve warehouse and company performance. The organization is led by a volunteer Board of Directors comprised of professionals from all aspects of warehousing and distribution. Lehigh Valley Economic Development Corporation (LVEDC) is your one-stop, full-service business and economic development agency. LVEDC is the organization your business can turn to for regional, economic and demographic information, finance and business incentives, site and facility availability, business networking and workforce services. By coordinating with our state, county and municipal governments, chambers of commerce, industry organizations, educational institutions and utilities, the award-winning LVEDC streamlines relocation and expansion processes for your business. Ben Franklin Technology Partners primary goal is to help companies strengthen their position in today’s competitive marketplace. The Ben Franklin Partnership links public, private, and educational resources to help small and medium-sized Pennsylvania businesses develop and commercialize new products and new processes and, hence, grow companies with the potential for significant job growth in the State. The Manufacturers Resource Center (MRC) is a non-profit organization founded in 1988. We assist small and mid-size manufacturers in improving their productivity and quality, lowering their costs and advancing their competitiveness using state-of-the-art technologies and proven business techniques. International Warehouse Logistics Association (IWLA) is the unified voice of the global logistics outsourcing industry, representing third party warehousing, transportation and logistics service providers. Our 500 member companies provide the most timely and cost-effective global logistics solutions for their customers and are committed to protecting the free flow of products across international borders. Manufacturing Extension Partnership (MEP) is a nationwide network of not-for-profit centers in nearly 350 locations nationwide, whose sole purpose is to provide small and medium sized manufacturers with the help they need to succeed. The centers, serving all 50 States and Puerto Rico, are linked together through the Department of Commerce’s National Institute of Standards and Technology. Centers are funded by federal, state, local and private resources to serve manufacturers. That makes it possible for even the smallest firms to tap into the expertise of knowledgeable manufacturing and business specialists all over the United States. These specialists are people who have had experience on manufacturing floors and in plant operations. MANTEC, For companies willing to commit to attaining measurable improvement in productivity, profitability and competitiveness, MANTEC leverages private and public monies for cost-effective solutions delivered by proven providers. 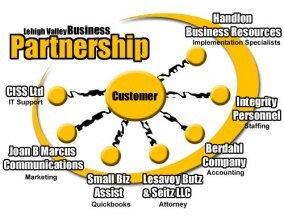 Lehigh Valley Business Partner Network, An association of seven small businesses in the Lehigh Valley.